If you didn't already know, the event takes place once a month in the heart of Brick Lane at 93 Feet East and if you're interested in going yourself I would say that it's probably a good idea to keep an eye on their Instagram page for regular updates, announcements and ticketing details. The event itself is a really cool mix of eating, drinking, music and general good vegan vibes! I went along with fellow vegan blogging buddies Jess & Anjuli and with over 30 different different food stands to choose from we were really spoilt for choice. We made a decision early on to share a few dishes so we could get to try as much as possible! Doors opened at 5pm and we arrived around 6pm and I was so glad that we arrived earlier than later because by the time we left it was really heaving with people. Going a bit earlier also meant we got to have a proper look around and take some photographs of all of the food on offer. I've also seen some reviews saying that it does get much more busy the later you go so if you're not keen on long queues etc then I would suggest getting there as early as you can. My first impressions were one of amazement to be honest. For some reason I had in my mind that it was all going to be in one building but in fact it was really spread out across 2-3 main areas and with lots of outside space for sitting down to eat. I was actually quite relieved because I'm not really a fan of battling my way through crowds and trying to eat at the same time! I was also in love with the whole aesthetic of neon lights, graffiti wall murals and palm trees and I would say that without a doubt this was the most hip vegan event I've ever been to. There was quite a lot to take in and such a huge amount of choice, it really was quite incredible! I knew I was in the mood for a burger but it was great to walk about and see all the other food available and to see what else was taking my fancy. There was everything and anything from asian food, pizza, hotdogs, mac n cheese, cakes, cookies and ice cream. You name it, it was there! I'm always in the mood for nachos and so when I saw these on offer from the Green Grill I just couldn't resist. They were topped with some kind of orange vegan cheese, a lightly spiced salsa and a a couple of other dips which I couldn't quite make out but they were all delicious and went really well with the tortilla chips. I was a little disappointed that they didn't come with any guacamole but still really enjoyed them. Anjuli decided to try one of the Green Grills 'Green Monster' burgers which looked incredible and I was quite tempted to go in for one myself. The matcha bun was particularly eye catching to say the least! I didn't get to try this myself but Anjuli really loved it so I think I'd try this one next time I come across it. Prior to attending the event I had seen the Vegan Nights team post a photo of these mind blowing mac n cheese bite balls by Itis LDN who specialise in vegan Caribbean cuisine. They were on the top of my list to try out at this event and I'm so glad we got our hands on them before they sold out because they really were quite something! They're basically mac n cheese rolled into balls and deep fried and topped with a mix of chilli sauce and mayo. And yes they were as delicious as they sound! These were also the perfect dish to share with my friends as they conveniently came in a portion size of three. Sticking to the theme of balls, we were all also really keen to get our hands on some arancini balls by the Arancini Brothers. I have actually had the pleasure of trying these before when I randomly stumbled across one of their stalls at Kings Cross once, and knowing how good they were I was keen to enjoy them again. It's also worth me telling you that they have now made their Old Street store 100% vegan and offer a whole host of different dishes including burgers, wraps and stews. They're well worth checking out if you're ever in the area! After devouring all of that delicious food it was time to check out the sweet treats and this rainbow cake by Vida Bakery really caught my eye. I'd promised Andy that I was going to take him home something and this seemed like the perfect choice! And let it be known that he really enjoyed it in the comfort of our bed with a cup of tea later that night. I decided to go in for a couple of scoops of ice cream from the Black Mylk stand which ended my evening at Vegan Nights on the most perfect note. They'd sold out of a few things by the time I arrived there but I went in for their miso, caramel and pecan flavour topped with a variety of different sprinkles and it was delicious. I really love it when you go to an event and everything exceeds your expectations. I don't want to hype it up too much and for you to be in anyway disappointed, but this really was the best vegan event I've ever been to! It feels so current and encompasses everything I love about life and being vegan. The whole evening was just filled with so many feel good vibes and to see it so popular, and so many others there enjoying themselves, really felt like a glimpse into a more compassionate future. I know for sure that this won't be the last time that I go to this event and I'm actually already really looking forward to going again when it's the Summer as I can only imagine it being even better when it's warmer outside. And after seeing so many other cute dogs wandering around I may even take one of my furry friends with me the next time I go! You can watch my vlog from this night here! 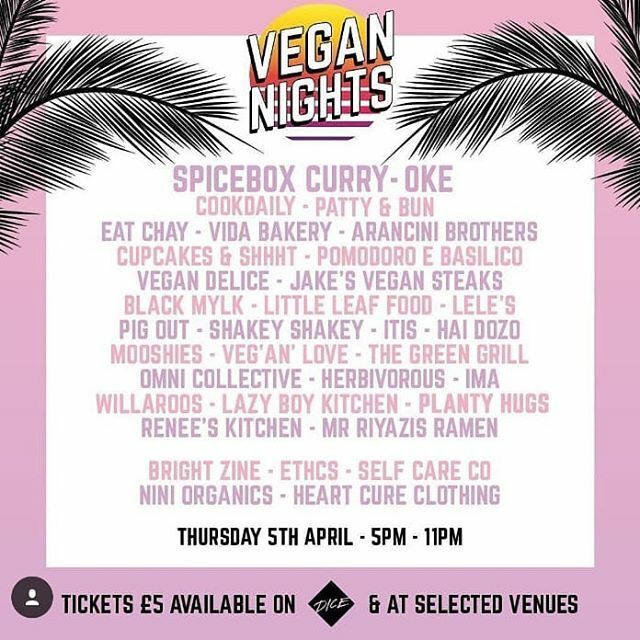 Have you been to a Vegan Nights event yet?